Magnolia scale has become an increasingly common problem on magnolia trees in Wisconsin. Popular magnolia species such as star magnolia (Magnolia stellata) and saucer magnolia (Magnolia x soulangiana) are very susceptible to this insect. Magnolia scale in early August. Appearance: Adult magnolia scale females are shiny brown, elliptical and convex in shape, and up to 1/2 inch in diameter. They can be mistaken for plant buds on the twigs. When alive, females are soft and leave a reddish stain when crushed. 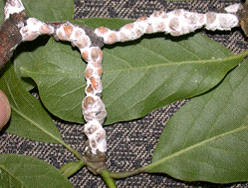 Immature magnolia scales are called nymphs and an early mobile nymph stage is called the crawler stage. Crawlers are yellow to reddish-brown in color and have an elliptical shape, but tend to be more flattened than adults. As nymphs mature, they secrete a white mealy wax on the outside of their bodies. This wax tends to disappear by late August. Life Cycle: Magnolia scale has one generation per year and overwinters as nymphs on one and two year old branches. Nymphs mature in early June, when adult females begin to lay eggs that hatch in late August. Control: Control of magnolia scale can be challenging. Only young, mobile crawlers are easily controlled. If you decide to use spray treatments for control, select a product that contains bifenthrin, carbaryl, cyflulthrin, horticultural oil, insecticidal soap, malathion, or permethrin. Proper timing of the application of these products is critical. Apply spray treatments in late August or early September and follow with a second treatment 10 to 14 days later. Systemic insecticides, such as those containing imidacloprid, have also been effective in magnolia scale control, but such products must be drenched into the root zone in early May. Finally, dormant oils can be used for control, but must be applied in March, before buds open. Be sure to read and follow all label instructions of the insecticide that you select to ensure that you use the insecticide in the safest and most effective manner possible. For more information on magnolia scale: Contact your county Extension agent. Thanks to Lis Friemoth, Dan Mahr and Ann Wied for reviewing this document.